As the sun sets around the world in preparation for Cinco De Mayo, I say goodnight to my followers, and goodnight to the 4th of May, or to Star Wars fans...May the 4th. Darth Vader was painted freehand and modeled after this image. 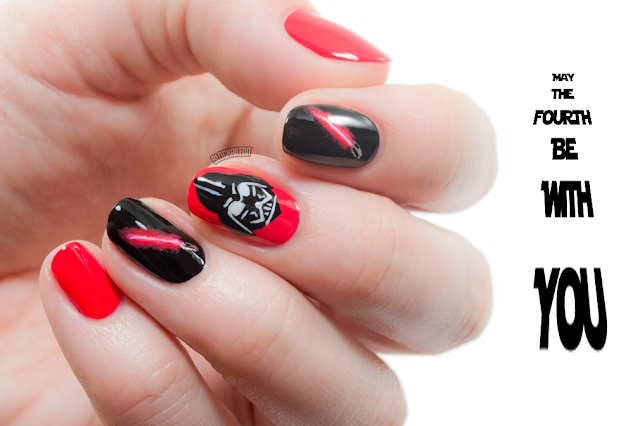 To get glowing lightsabers, I dabbed red (Tasmanian Devil Made Me Do It from OPI) in a line, then painted a mixture of red and white, followed by a skinny line of pure white (White Porcelain from INM). The sabers handles' were done mainly with Push and Shove (OPI).